After more than four decades of service to the inner city, an office in the suburbs might as well be on the moon for School Sister of Notre Dame Charmaine Krohe. “This is a bittersweet move for me,” acknowledged Sister Charmaine, who on July 14 was among seven women installed as new council members for the School Sisters of Notre Dame Atlantic-Midwest Province in a ceremony in Waterdown, Ontario, Canada. Sister Charmaine spoke to the Catholic Review June 27, three days before she officially completed a five-year run as president of Mother Seton Academy, a tuition-free middle school in Baltimore sponsored by the School Sisters and five other congregations. Before that service, her entrepreneurial skills were put to use as the first woman president of the St. Vincent de Paul Society of Baltimore and the founder of the St. Ambrose Outreach Center, which provided the Park Heights community with everything from a soup kitchen to a Head Start program and adult literacy classes. “My life has been totally devoted to the City of Baltimore,” said Sister Charmaine, a Pittsburgh native who entered the convent here as a teen in the mid-1960s. It is all of 5.6 miles from Mother Seton Academy to Villa Assumpta in Towson, where her new mission will be based. As a provincial councilor, Sister Charmaine said she will “discern with our sisters the future of the province and its ministries,” under the direction of Sister Kathleen Cornell, who was elected to a second four-year term as provincial leader. Other members of the provincial council with local ties include Sister Paula Dukehart, who has worked in hospice care in Baltimore, and Sister Josephann Wagoner, formerly principal of School of the Cathedral of Mary Our Queen in Homeland. 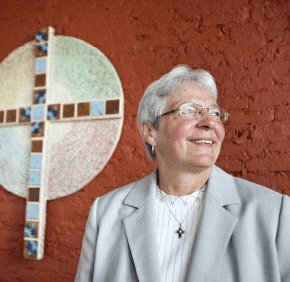 Sister Kathleen, a Baltimore native, pointed to the School Sisters’ sponsorship of the Caroline Center, a job training center for women, and Marian House, a halfway house for women in recovery, as examples of that commitment from her congregation. She also mentioned Sisters Academy of Baltimore, which serves girls from low-income neighborhoods in grades 5-8, and Mother Seton Academy, which in 2009 Sister Charmaine helped move from a cramped former convent in Fells Point to a spacious, renovated building that formerly housed St. Ann School. Come August, the 22 members of the Mother Seton Academy Class of 2012, from humble backgrounds, will enter the likes of Calvert Hall College High School, the Institute of Notre Dame, Loyola Blakefield and Mercy High School. Sister Charmaine, 64, has been “called several times” previously to take a leadership position with the order. Copyright (c) July 17, 2012 CatholicReview.org.